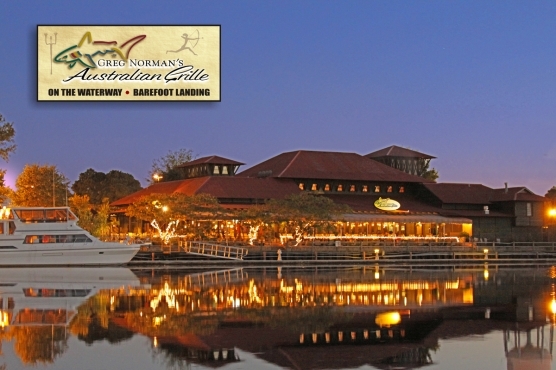 The champion golfer Greg Norman lends his name to this Australian grill that offers spectacular décor and food that will have you feeling that you are dining in one of Sydney’s wonderful riverside restaurants – all while here in North Myrtle Beach, SC. Not only will you enjoy some of the finest tasting food, but the artistic presentation is just part of the flair of this exotic waterside dining experience. The wide variety of foods offered on the menu ranges from wood-grilled steaks, seafood and chicken to salads, pastas and sides that will tempt the palette of even the most picky of eaters. The steaks are worthy of praise with a minimum 28 days of aging of prime, black angus beef. Regardless of your wishes, there is an entrée that will be sure to quench any craving that you may have. In addition to the impeccable food, the ambience and atmosphere coupled with the impeccable service from the knowledgeable staff will be sure to impress your entire group. Greg Norman’s Australian Grill also has an extensive wine list which has earned them the Award of Excellence from Wine Spectator magazine for over 10 years!